Good morning everyone. I hope you are all well. This is the season where our busy lives become even busier with shopping and cooking and creating. We make list after list after list, being sure no detail is left out. Many of us creative creatures are peddling our wares at holiday shows, our hands busy as many hours as we can stay awake. In between we are making those special gifts for the ones we love. I really do love this season. I love to create and I love to give gifts. I love to bake. I love to make my wrappings as beautiful as the NYC store windows. And I love to entertain, where I can pull out all my fancy china and crystal. I love to adorn my home with greens and berries, to make it sparkle with twinkling lights. I use to live in an 8 room Victorian house, and every room, including the bathrooms were fully decorated. We had 2 or 3 trees each year, usually only one that was real. I would theme rooms, so that all the decorations would coordinate. The kitchen was usually gingerbread men. The living room was pinks and burgundies Victorian. I would use yardage of tulle to drape the tops of my curtains with nosegays or bells or wreaths at the corners. It was such fun. One year I had a tree trimming party. Everyone brought an ornament that meant something special to them. Then we had a delightful buffet and wonderful company. Now when I decorate my tree each year, as I unwrap each ornament, I can remember the person that gave it to me. I never rush when I decorate my tree. It is a trip down memory lane. Several years I hosted full blown Victorian parties. I would research authentic Victorian meals to add to my tables. The white china with the gold trim would come out. The crystal would be cleaned and the silver would be polished. The antique table cloth would be placed on the table, always risking it being ruined by a spill. I would look through books and magazines for centerpiece ideas and ways of displaying the many dishes of food I would serve. The first year was complete chaos, because as we all know, timing in the kitchen never ever works the way we want it to. Thank goodness for wonderful friends that love to cook. Each year I learned to do things easier and better. One year several of us dressed in Victorian clothing, just the women of course. A wonderfully creative friend whipped up a fabulous pink and black check taffeta Victorian gown for herself. She was the envy of all of us. I loved those parties. Several years I would host a cookie swap. Just a small gathering of us gals with either a light lunch or just desserts. Cookie swaps are fabulous. You figure out how many guests are coming. 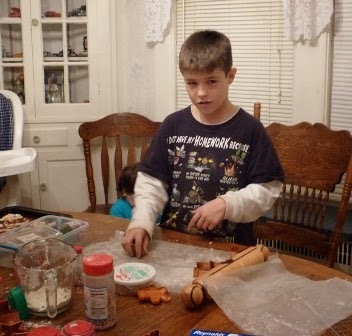 Then each guest ,plus yourself, makes one type of cookie. Depending on how many people are attending, you either make a half dozen or a whole dozen per person. Then you bag them up individually, some getting so very creative with their packaging. At the swap, each person shares what they have brought and you end up with a whole tray of assorted cookies for the holidays. 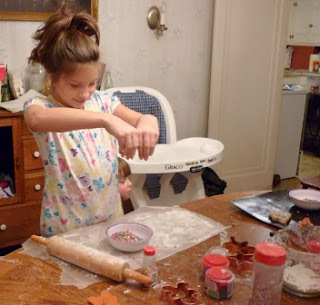 It is a great time with friends and a great short cut to your holiday cookie baking. My Victorian parties were so formal, that they would be adult only. So for a few years I would host a families open house on a Sunday afternoon. A buffet would be layed out all afternoon as our friends and their children would come and go. I always had a favor for the children, either an ornament or some small trinket. One year I tried having the kids decorate cookies. All during the season, the carols and Christmas music would play in our house. My husband was such a clever man. He recorded all our records...you remember records right?...onto a VHS tape. Hhmmm do your remember VHS machines? Boy am I old, heh! Anyways, those tapes held a lot of info and we were able to record all our favorite albums in one continuous loop. Even the albums we loved as children. You never had to change records or tapes. It was wonderful. In between all my entertaining and planning and cooking, there was sewing and cutting and gluing. I use to make every single one of my gifts. Well, no that isn't true. There were a few men that a made gift just wasn't going to work. Men are the hardest to create a handmade gift for, don't you think? I would sew right up and past Christmas day. My neighbor's house was very close to ours on one side and she would say; "I went to bed Christmas Eve and you were sitting at the table sewing. And I would wake up Christmas morning and you were still at the table sewing." That would be me! I will even admit now, that sometimes I would be hand sewing in the car finishing up a gift for the person we were on our way to see. As my daughter got older, she swore "she" would "never" do that. She hated it. Well she now has 4 wonderful children and works a full time job, and yes, she is doing things last minute in the car. We say it is tradition, heh. Another tradition with the women in our family use to be wrapping gifts on Christmas eve. Well, we all were so busy with other things that the wrapping would get left to last. My mom would stay up all night wrapping gifts. She would slip into bed just long enough for us kids to find her Christmas morning. That seemed to have carried down to myself and my sister and my daughter. And might even travel down to my granddaughter. Time will tell, she is only 14 right now. I remember all us kids gifts from Santa were always wrapped in the same paper every year. When I got older and was sent to the attic for something, I came across this huge roll of Christmas wrapping paper. Yup, you guessed it, it was Santa's wrapping paper. I have to admit I was a bit disappointed. As us girls got older we would stay up with mom and do our wrapping together. This became quite an event. We had snacks and lots of wine. Yes, we had lots of laughs too....oh my lots of laughs. Dad would stay up for a while with us, but he was the smart one and decided sleep was more important. As each gift got wrapped it would find its way under the Christmas tree. By morning that tree was overflowing with gifts spilling out into the room. We would marvel at the sight, take a picture and "always" say, "we did too much again this year, next year we have to cut back". We all spent Christmas day together, so we all spent the night at Mom and Dads. Well at least until the families grew too big to have enough sleeping room. When Grammy Savage was alive she would spend the night at Mom and Dads. She would sleep on the couch in the living room where the tree stood. Well, she really didn't sleep either, she was up with us girls. But she would lay down so that the kids would find her first the next morning. We were allowed to gather our stockings filling over the tops from the stair railings and bring them to our rooms. This gave the adults time to open their eyes from the one hour sleep they had gotten and grab a cup of coffee before the mayhem started. But Grammy was a dear and usually let us curl up near her to share the little treasures that our stockings held. Sometimes those little gifts were more fun than the ones wrapped under the tree. And of course there was always lots of candy in the bottom of those stockings. I remember gold wrapped candy coins and candy canes. We had Hershey Kisses and later Hershey Hugs. No wonder Christmas morning was mayhem, we were all on sugar highs. We still all carry that tradition of overstuffed stockings filled with special little treasures. Great care is spent on finding just the right things. Of course you always got a toothbrush and deodorant and chap stick. Those were guaranteed. Oh and those great Lifesaver Storybooks, filled with 8 different rolls of Lifesavers. Christmas would last forever. We had other families to visit, Grammies and aunts, brothers and sisters. More gifts and more wonderful food. And more traditions, like sitting at the kids table or wearing the special aprons. Traditions that we looked forward to becoming adults for like Boule (a wonderful white wine and Madeira marinated strawberries punch) and sitting at the grownup table. New traditions like Christmas brunch and Italian Christmas dinners. As children we had a whole week to look forward to of new toys and new clothes and new fun. As parents we had a whole week of taking a deep breath and a much needed rest and not worrying about messy houses. Many of the traditions carried over after we got married or moved out on our own. Many new traditions were added. As time passes, children move too far away, life changes. We hold onto our memories like precious treasure. The holidays don't feel like they use to, but that doesn't mean they aren't special anymore. It is up to each of us to take up the torch and create new memories for ourselves, our children and our friends. Christmas is about sharing; our love, our hearts, our food, our gifts. It is about being with others; family, friends, neighbors, strangers. It is about music and lights. It is about a feeling inside your heart. So please make some new traditions, share them with someone new, and let those lights shine brightly. Don't ever let anyone tarnish your tinsel. All of you are very special to me.